DCAA (Defense Contract Audit Agency) was created by act of Congress in 1965 to perform all necessary contract audits for the Department of Defense (DOD). Their mission also includes providing accounting and financial advisory services to all DOD components in connection with the negotiation, administration and settlement of contracts and subcontracts. Today DCAA employs more than 3,600 auditors and maintains more than 350 branches and sub-offices around the world. 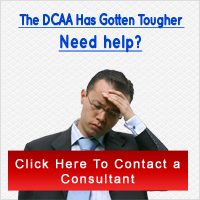 In recent years, DCAA has also provided its services to many other Government agencies on a cost-reimbursement basis.